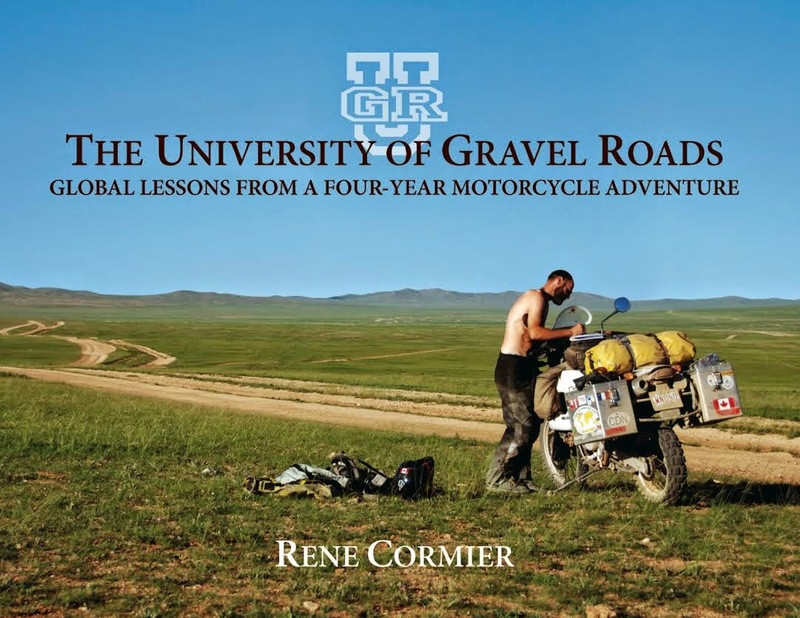 The University of Gravel Roads, which captures author Rene Cormier's solo circumnavigation of the world, has become a Canadian best seller. Immediately popular as soon as it was published in 2010, the book has continued to be in demand, fuelled in large part by extensive author appearances across North America. "Sometime when we were out guiding African motorcycle safaris in the summer of 2014, we sold our 5,000th copy," said Cormier. The University of Gravel Roads won the Bronze medal in the 2010 Independent Book Publishers awards, the 2010 da Vinci Eye Award, and was a finalist in the Eric Hoffer Award for Short Prose and Literature. It also enjoys a five-star rating on Amazon.com. In 2003, 33-year old Cormier left a successful career and cashed-in his few possessions to finance his dream: a motorcycle trip around the world. Planning to be away for three years, a need to replenish his financial resources stretched the travel over five years. Through narrative and stunning photography, his book covers countless experiences of his 41-country, 154,000-kilometre (95,000-mile) route, completed with no idea of what he was about to learn, no sponsors, and no support vehicles. "I'd learned that the world was full of loving, generous and honest people," said Cormier. "I’d learned how little money it took to be happy on the road. I'd learned that the more of myself I shared with the locals, the more they shared with me and the more I rode away with. I'd learned that the simpler my life was, the more I was able to enjoy it." Cormier is an author and founder of Renedian Adventures, now in its sixth year of guiding African motorcycle safaris. He and his wife, Colette, and their son, Jacques, spend half the year in Canada and the other half in southern Africa, where he loves showing people a very special part of the world.